Spring without XML files? - What an idea! This tutorial will show you everything you need to know in order to start developing and testing stand-alone Spring 3.0 applications. There really isn’t anything too difficult about learning Spring. Spring, at its core, is a very simple and easy to learn “Inversion of Control” (IoC) container, and I’m going to show you just how easy it is to learn. But before you can learn how to leverage the benefits of a Spring IoC container, you have to have an environment setup that will allow you to write, test, compile and run some Spring-based code. At the bare minimum, you need a Java Development toolKit, or JDK, at version 1.5 or higher, installed on your machine. Know where your JDK is installed. If you haven't got one installed already, well, all I can say is "shame on you." I’ve got my JDK installed to the _jdk1.6 folder off the root of C:\. This tutorial is going to be hard-core, so if you want to follow it, you’re going to have to open a command window, move to the bin directory of your JDK, and be ready to issue some old-school java and javac commands. The first command you can issue is to verify the version of the JDK you are using: java –version. My JDK installation spits back a version of 1.6.0_18, which is more than sufficient for meeting the minimum requirements of the Spring 3.0 framework. The next thing you need to do is download the Spring framework. You’ll have to find the download at the springsource.com website. The URL that was used at the time of writing was http://www.springsource.com/download/community At that location you’ll likely have a few options for downloading. The two you need right now are the 21.4 meg download named spring-framework-3.0.2.RELEASE.zip, and the 155.7 meg download named spring-framework-3.0.2.RELEASE-dependencies.zip. Unzip the 21.4 meg RELEASE downloaded to the root of C:\. 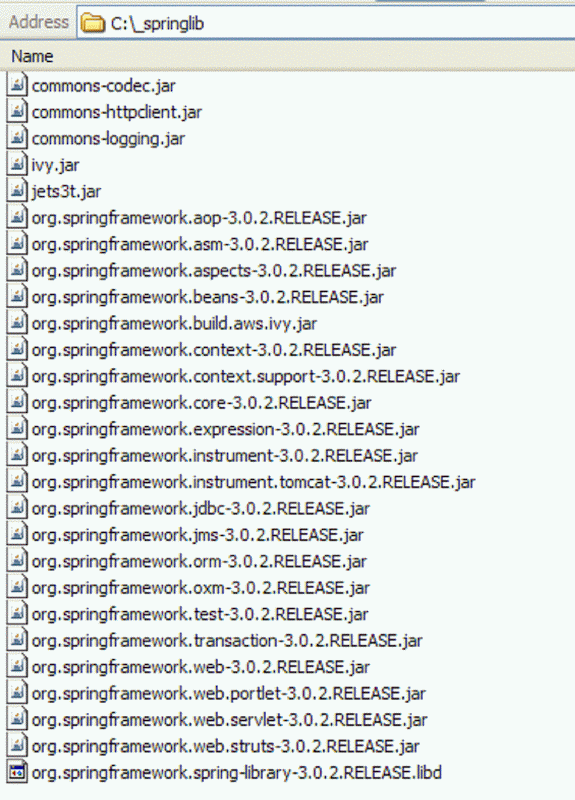 You will end up with a folder named spring-framework-3.0.2.RELEASE. Move to the folder named C:\spring-framework-3.0.2.RELEASE\projects\spring-build\lib\ivy. This folder contains five JAR files. 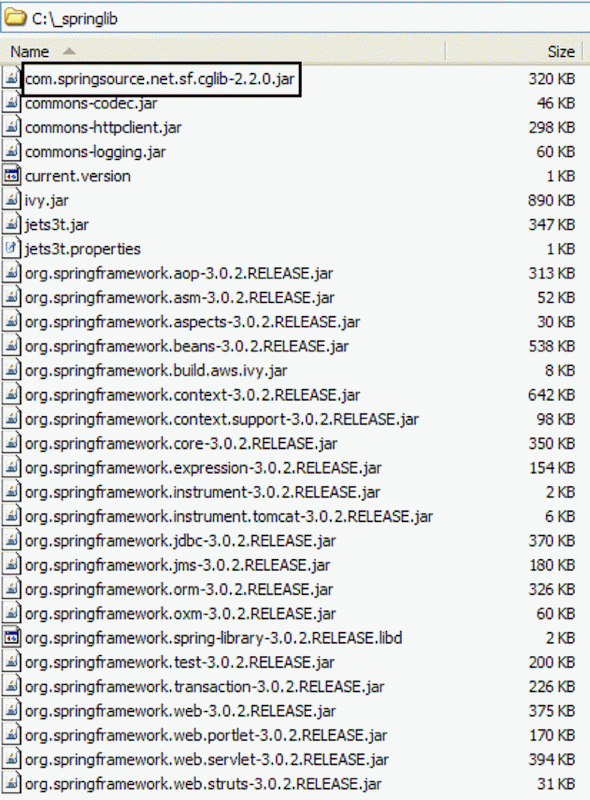 Move each of these JAR files into the C:\_springlib folder that you just created. com.springsource.net.sf.cglib-2.2.0.jar is the last JAR we need to hunt down. In the 2.2.0 folder, find the file named com.springsource.net.sf.cglib-2.2.0.jar, and move that as well into the _springlib folder. In last leaf of this folder, I’m going to create a simple Java file named BillRunner. We're going to model a simple billing system for a Cloud computing operation, and the BillRunner will be the entry point of the application. So go right ahead and create a Java class, named BillRunner, that has a runnable main method. The next step is to just make sure everything is configured properly. To do this, I’m going to import and create an instance of a pivotal Spring class, and just do a System.out.print( ) on the instance. If we can compile and run the code, then we’ve successfully configured our environment to develop, test and run Spring based Java applications. Compile and Run: Are You Configured??? Here’s what my command prompt looks like after successfully running and compiling the BillRunner. Congratulations. You're up and running, and capable of running stand-alone, Spring based applications. Your next step should be writing some slightly more complicated Java code, and see how you can leverage Spring's Inversion of Control container. The next tutorial demonstrates how to both do Spring without XML, and how to do it old school with the standard XML configuration file. What's better? Jenkins or Maven? Can you answer these 10 Jenkins quiz questions?